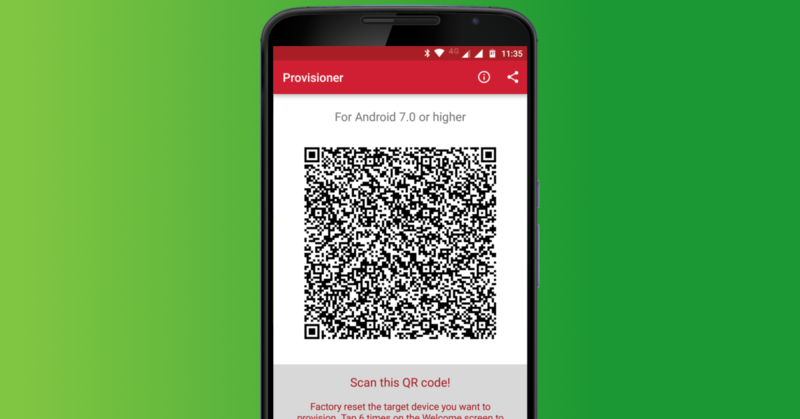 Overnight, MobileIron’s Provisioner app updated to version 1.2.0 and with it came the long-awaited support for QR code generation. 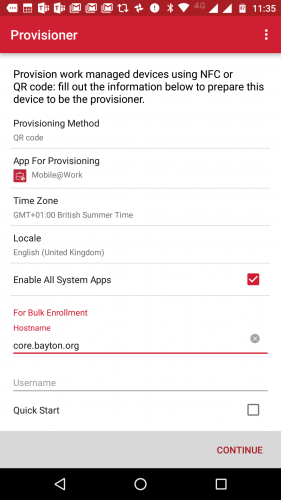 The Mobile@Work DPC received official support for QR enrolment on the 16th of this month with version 9.5.1.0 following MobileIron Go last month, so it was only a matter of time! There are indeed a couple of differences here, the most significant being the addition of PROVISIONING_ADMIN_EXTRAS_BUNDLE which wasn’t previously supported by the Mobile@Work DPC prior to the 9.5.1.0 release; this addition makes it even easier to get enrolled as it pre-applies the server URL and username within the DPC, leaving just a password (or PIN) required in order to get started. Nice. Less significant, but very nice to support nonetheless is PROVISIONING_LEAVE_ALL_SYSTEM_APPS_ENABLED, providing the ability to leave system applications enabled. Now when enrolling, the EMM won’t have to try to download/enable system applications as they’ll already be available – another nice touch, however it does enable everything, bloatware too. You may find it easier to leave this off and manage via EMM to avoid having to manually hide all unwanted packages. Otherwise, PROVISIONING_LOCALE, PROVISIONING_TIME_ZONE and PROVISIONING_LOCAL_TIME are the same as those found in the NFC payload. Mine hosted is 9.4.x, MobileIron’s is 9.5.1.0. This means the checksum is going to need to be updated more frequently, and I’m not sure how MobileIron are managing that but as they’ve been using this to date with the NFC payload, it’s probably no big deal. From Provisioner 1.3, MobileIron have switched over to Admin Signature Checksum. This means the QR code generated in-app will be valid for far longer! The use of the Provisioner app for QR generation is an interesting one; I’d hoped EMM admins would be able to generate them directly from the Core/Cloud admin console either generically or as part of adding in a new device (wherein the admin extras for username could also be generated ad-hoc). Instead, admins will need to install the app on a device and generate them as required. Thankfully these can be shared over email or any other supported intent which doesn’t require the second device to be anywhere near those being provisioned which is a definite improvement over NFC. For those wanting to generate QR codes without the use of the Provisioner however, my Manual Android Enterprise work-managed QR code generation for MobileIron document is still 100% valid and can used also (as long as you don’t ask MobileIron for support). If you’re looking for QR code provisioning enrolment guides also, check out Android Enterprise provisioning guides. So there we are! 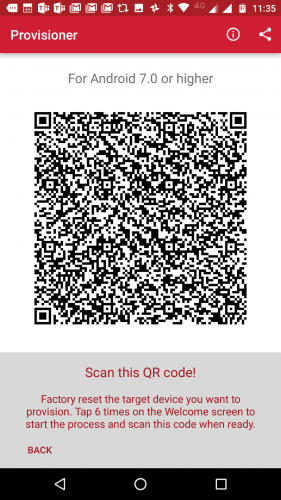 Only two months after discovering it myself, MobileIron now officially support QR code provisioning for Android Enterprise. Are you a MobileIron admin or end-user? Will you be looking to make use of QR code provisioning for devices in your organisation? Let me know your thoughts in the comments, @jasonbayton on twitter or @bayton.org on Facebook. If you’re on LinkedIn, you can also find me there – /in/jasonbayton.